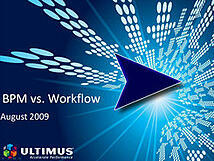 BPM vs Workflow vs. Low-Code: What are the differences? Workflow Software is a simple automation tool for directing documents and tasks to the responsible users in a business process for further actions. It provides information and support for each step of the process and business cycle. Materials and documents pertaining to the process may either be physically transferred from one user to the next, or they may be maintained in a database or server with access given to the appropriate users at the appropriate time. In this system alarms and triggers can also be set to alert executives and process owners when the tasks are overdue. This automated system of operations ensures that work is moved through the system in a timely fashion and is processed correctly by the appropriate users. Low-code development, which has become very popular in recent years, focuses on shortening software application delivery time by reducing the amount of hand-coding required during development. Low-code BPM platforms combine low-code development principles with robust BPM capabilities to accelerate development of automated business process applications. Newer, more advanced low-code BPM platforms, such as Ultimus’ Composed Process Solutions platform, use innovative “generative programming” principles to further speed application delivery and reduce the cost and complexity of automating and managing business processes. Generative low-code development platforms generate individual business process solutions and solution “families” (i.e., related applications that are managed and work together as one larger application) from prebuilt, reusable digital assets and descriptions of each solution’s business requirements.